Use this form to submit your marketing tech "stack" image before midnight Pacific time, Friday, April 6. You can build your stack in PowerPoint, Keynote, or Google Slides, and then simply export it (or download it) as a JPG, GIF, or PNG image or a PDF slide in a 16:9 format (so a 1,600x900 pixel image would be perfect). Your stack graphic can contain as many or as few of the technologies that you use in your marketing department, although the more complete picture you can share, the better. You don't have to identify specific vendors if you don't want to, but if you can, the community would appreciate knowing what works for you (and those vendors would certainly appreciate the shout-out). Only contribute what you consider appropriate for public consumption. The goal is to share broad concepts and ideas, not reveal anything confidential or proprietary. BY SUBMITTING AN ENTRY ON THIS FORM, YOU ARE GIVING THIRD DOOR MEDIA, INC. AND MARKETING TECHNOLOGY MEDIA, LLC PERMISSION TO PUBLISH AND REPRODUCE YOUR MARKETING STACK SLIDE GRAPHIC. We will share a deck of all entries submitted at the conclusion of this contest, so we can all learn from each other with this exercise. The full deck will be released at MarTech West in San Jose, April 23-25 and published openly on SlideShare. For every valid (i.e., not junk/spam) entry, the MarTech conference will donate $100 to Girls in Tech, up to a total of $10,000. 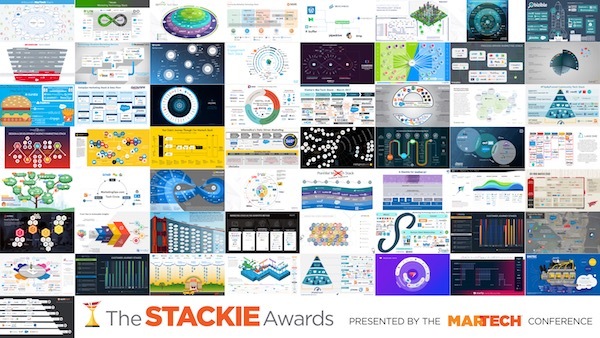 We will select five entries that we think make the best contributions to this contest to receive Stackie trophies at an awards ceremony on Monday evening, April 23, at MarTech West in San Jose. You don't need to be present to win (but it would be nice). If you have any questions with your submission, please email me at sbrinker@chiefmartec.com. Thank you for contributing!